The term baroque means unusual, bizarre, irregular in shape and it was first used at the end of the XVIIIth century by art historians who judged the artistic developments after the Renaissance negatively; in Rome the XVIIth century could be more appropriately called the Age of Gian Lorenzo Bernini because of the influence this artist had on all aspects of art; you can see a directory listing works by Gian Lorenzo Bernini; he created very novel coats of arms which Filippo Juvarra included in his book of etchings showing the finest coats of arms of the Popes. 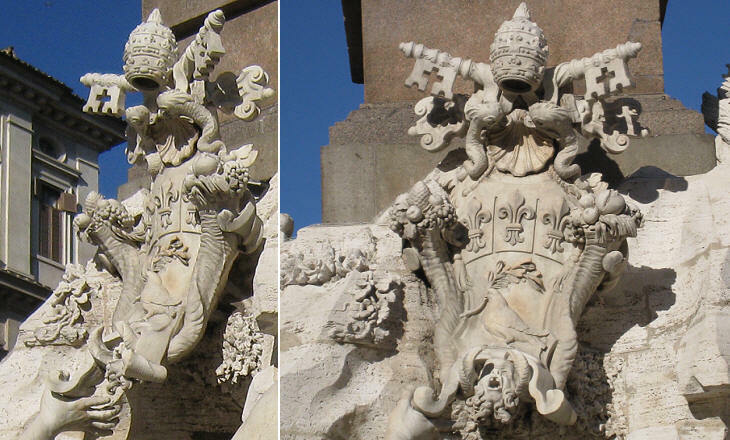 The eagle and the dragon, the heraldic symbols of Pope Paul V competed for space in the pope's formal coat of arms, but were an excellent subject for decorative purposes; they were used as an allegory of the pope in Fontana dell'Aquilone and in many other fountains built by this pope, including Acqua Paola, the largest one. 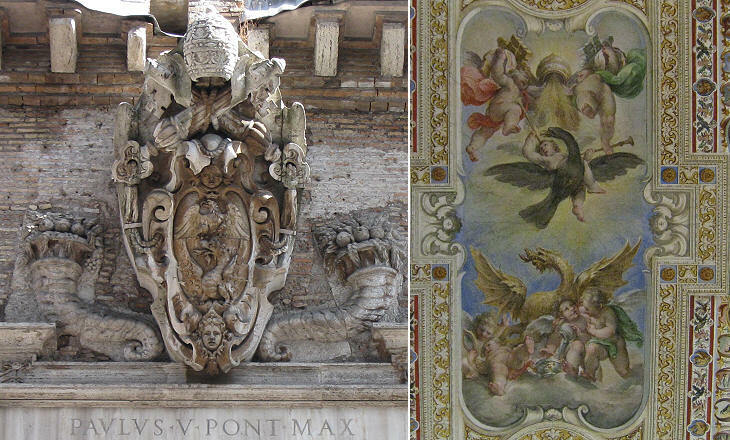 Because the Borghese continued to play an important role in Rome after the Pope's death their eagles and dragons can be seen in many parts of the city (see a page dedicated to them). It seems that Pope Urban VIII at the time of his election told Gian Lorenzo Bernini that he was very lucky to avail himself of the services of the young artist (then aged 25). 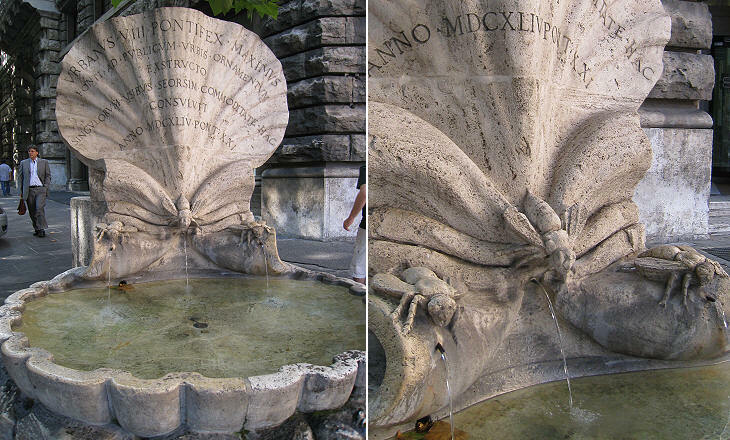 At the time Bernini was known as a talented sculptor, but the Pope assigned him a key role as the chief architect of his long pontificate; Bernini designed many formal coats of arms (including those on the Canopy of S. Pietro), but he also decorated Fontana delle Api and la Barcaccia di Piazza di Spagna with the heraldic symbols of Pope Urban VIII. See a page on the Sun of the Barberini for an analysis of the Pope's second heraldic symbol. Bernini captured the favour of Pope Innocent X by designing the main fountain of Piazza Navona; the lower part of the fountain is full of movement and Bernini did not want to lessen it by placing a rigid coat of arms at the very centre of the scene; he therefore designed it as an assemblage of various elements which could be seen from different angles; the whole structure is supported by a simple gesture by one of the four rivers and the coat of arms seems to float in the air; this effect was made possible by technical improvements in fitting together the various pieces which made up the coat of arms. The use of stucco was also improved at the time of Bernini who designed an amazing coat of arms using this material for a nephew of Pope Innocent X in S. Andrea al Quirinale. For many other coats of arms of Pope Innocent X see a page on the dove, the Pope's heraldic symbol. 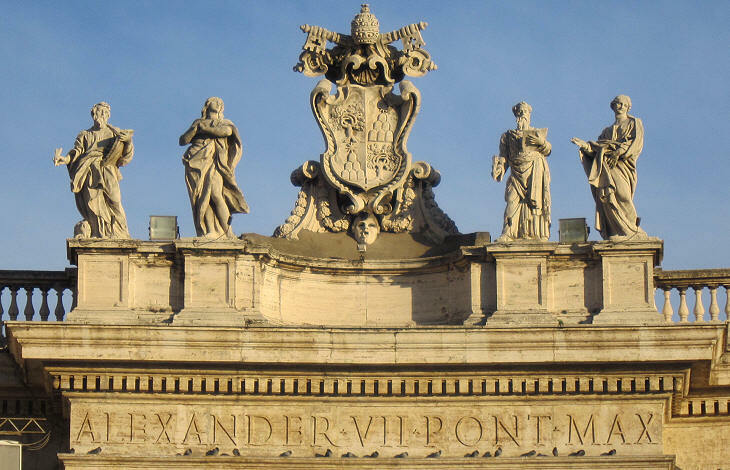 Bernini worked closely with Pope Alexander VII on the design of Piazza S. Pietro; their objective was to make it the appropriate solemn entrance to the heart of the Catholic Church; the gigantic size of the coat of arms was required by the length of the colonnade and it probably pleased the pope, whose symbol was larger than the statues of the saints at its sides. For many other coats of arms of Pope Alexander VII see a page on the six mountains and the star which were part of his coat of arms. 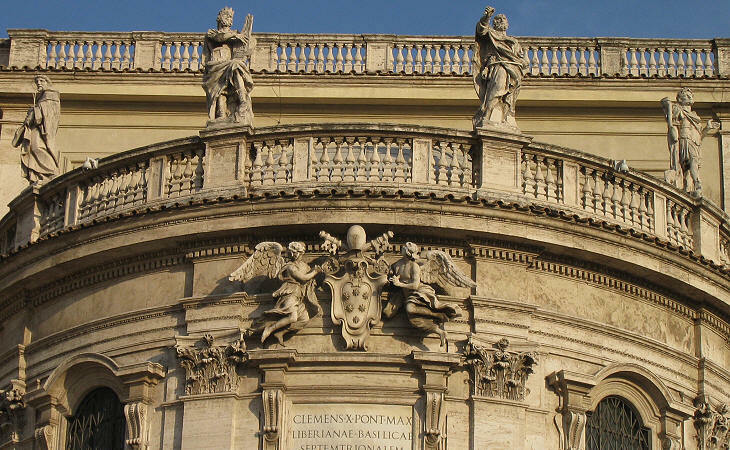 Bernini developed a project for the decoration of the apse of S. Maria Maggiore, but it was too expensive for the successors of Pope Alexander VII; yet the pattern he set in Piazza S. Pietro was followed by Carlo Rainaldi by placing statues of saints on the balustrade (more on this topic in a separate page), but the coat of arms of Pope Clement X is rather small. The influence of Bernini can also be seen in the coat of arms designed by Giovanni Antonio De' Rossi in Palazzo Altieri. The image used as background for this page shows the coat of arms (it opens in another window) of Pope Gregory XV in S. Ignazio. You can see directories listing works of architects and of sculptors of this period.